Recorded live at USA Cycling HQ in Colorado Springs in 2014, this comprehensive video series is an indispensable resource no matter the level of athlete or the discipline that you coach. With over 15 hours of presentations from some of the cycling world's foremost authorities, learn cutting-edge philosophies on technical skills, nutrition, strength training, BMX cycling, revenue generating and much, much more. Not a coach? No problem. What you'll learn from this series will positively impact every facet of your training and translate to huge performance gains. A presentation by Coach Mike Durner entitled - Addressing Individuality of Paracyclists. Recorded Live at the 2014 USA Cycling Coaching Summit. Topics include: Just Like Everyone Else, General Differences, Individual Differences, SCI Considerations, Amputations, Traumatic Brain Injuries, Cerebral Palsy, Stroke, Birth Defects, Visually Impaired, Bike Fit, Recovery. Addressing Individuality of Paracyclists [3 of 6]. A presentation by Joe Friel entitled - Introduction to Power Meters. Recorded Live at the 2014 USA Cycling Coaching Summit. Topics include: Importance of Measuring, Functional Threshold Power (FTP), Normalized Power (NP), Variability Index (VI), Intensity Factor (IF), Efficiency Factor (EF), Comparing Power to Heart Rate (Decoupling), Power-Based Planning, TSS Score. A presentation by Peter Haberi entitled - Mindfulness & Cycling: Bringing Your Mind Along for the Ride. Recorded Live at the 2014 USA Cycling Coaching Summit. Topics include: Overview - 3 Key Questions, Fragility of the Mind, Wandering Mind, What Top Athletes Have to Say, Definition of Mindfulness, Time to Think, Being In Charge of Your Emotions, Tuning In To the Present, Accepting the Negative Thoughts, Goals vs, Values. A presentation by Neal Henderson entitled - Hypokinetic Training for Hyperkinetic Racing. Recorded Live at the 2014 USA Cycling Coaching Summit. Topics include: Neal's High Performance Algorithm, The Important Questions About Hypokinetic Training, Wrap Up. A presentation by Dr. Tyrone Holmes entitled - Pricing Your Services: 10 Steps for Maximizing Your Income Potential. Recorded Live at the 2014 USA Cycling Coaching Summit. Topics include: Objectives, Pricing, Multiple Revenue Streams, The Business Model, Passive Income, Income Generation by Revenue Streams, Being a Speaker, Being a Coach, Happiness and Labor Intensivity, Increasing Your Fees, Increasing Visibility, Value Proposition, Product Differentiation, Doing Something Noteworthy, Offer Multiple Purchase Options. A presentation by Dave Steigerwald entitled - Legal Issues in Organizing Your Business. Recorded Live at the 2014 USA Cycling Coaching Summit. Topics Include: Business Organization Drivers, Liability Protection, Entities and Tax Efficiency, Entities and Business Goals, Defining Business Goals. A presentation by Tara Butler Floch entitled Getting to a Powerful "Yes": How to Enroll Clients With Ease. Recorded Live at the 2014 USA Cycling Coaching Summit. Topics Include:Selling Yourself, Sales vs. Enrollment, Figuring out Client Fit, Dealing With Self-Doubt, Firing Clients, Success and Equal Energy Exchange, What Happens With Well Enrolled Client, Breakthrough Session, The Secret Formula - Questions to Ask, What To Do Next If Client is Good Fit. SMT2 - What is Hydration? A presentation by Dr. Stacy Sims entitled - What is Hydration? Recorded Live at the 2014 USA Cycling Coaching Summit. Topics include: Concerns with Dehydration, Defining Hydration, Impact on Performance, Fluid Balance, Sports Drinks, Sodium and Osmolality, Electrolytes, How Much to Drink, Q&A. A presentation by Dr. Brent Ruby entitled - Muscle Glycogen Recovery, Exercise and the Implications of Environmental Stress. 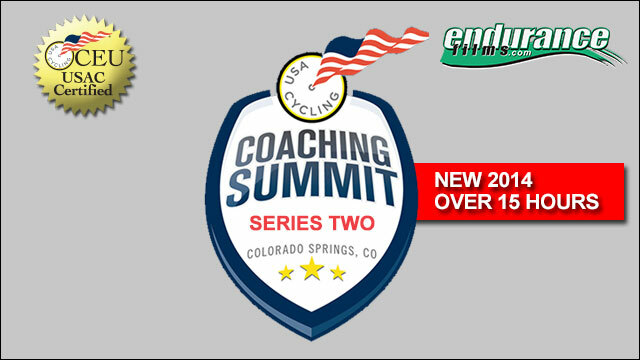 Recorded Live at the 2014 USA Cycling Coaching Summit. Topics include: Research Structure, Lab vs. Field, Looking at Previous Research, Recovery Will Happen, Marketing of Simple Carbohydrates, Recovery Becomes Trendy, How Short is Nutrition Window?, Chocolate Milk, Combining Carbs and Caffeine, Adding Amino Acids, Impact of Ambient Environment, Genes and Mitochondrial Development, Cold and Heat, Glycogen Depletion in the Field, Effect of Compression, Fast Food, Conclusions & Take Home. A presentation by Coach Dave Jarrett entitled - Dynamic Comparisons Between XC Skiing and Cycling. Recorded Live at the 2014 USA Cycling Coaching Summit. Topics include: Nordic Combined 101, History of US Nordic Combined, NC Training Applied, How We Use Cycling in Our Training, Q&A. A presentation by Jon Tarkington entitled - Consumer Near Infrared Spectroscopy as a Training and Recovery Tool. Recorded Live at the 2014 USA Cycling Coaching Summit. Topics include: What is NIRS?, Methods and Variations, MOXY Biometric Data Basics, Sp02 vs. Sm02, Practical Application Notes, The MOXY Unit and Interface, Current Graph Basics, "Combined" Graphing, The Process, Individuality, Temperature Influence, Loaded Hypoxia, Recovery, Endurance, The Future. A presentation by Dr. Brent Ruby entitled - The Connection/Disconnection Between Heat Stress, Hydration and Performance. Recorded Live at the 2014 USA Cycling Coaching Summit. Topics include: Field Research Models, Quantifying Energy Demands, Instrumentation, Stress Factors, Heat and Fire Fighters, Environmental Factor in Fuel Consumption, Eating On Move and Supplementation Studies, Ultra Distance Examples, Monitoring Hydration, Overheating Case Study, Modern Hydration Messages, Psychological Studies, Prevention. A presentation by Dr. Stacy Sims entitled - Women Are Not Small Men. Recorded Live at the 2014 USA Cycling Coaching Summit. Topics include: Design and General Assumptions, Female Physiology, Hormones, Menstrual Cycle, Osmolality, Hyponatremia, Thermoregulation, Metabolism, Practical Translation, Recovery, Peri and Post Menopause. A presentation by James Herrera entitled - Strength Training for Cyclists. Recorded Live at the 2014 USA Cycling Coaching Summit. Topics include: Benefits of Strength Training, Impact on Cycling Performance, Whose Your Athlete?, Effects on Performance, Incorporating Strength into Training Plan, Concurrent Training, Compound and Olympic Lifts, Power Development, Specific Exercises, Limitations, First Steps with Athletes, Programming, Q&A. A presentation by Dr. Kristen Dieffenbach entitled - Teen Talent: Tactics and Strategies for a United Parent and Coach front. Recorded Live at the 2014 USA Cycling Coaching Summit. Topics include: The Junior Support Team, The Teenage Species, Today's World for Juniors, Teaching Teens, Adolescence, What a Teen Needs, Teenage Athletes, What is Teen Talent?, Teen Athlete Development Models, Variation as Teens Grow, 10 Key Factors in Talent Development, The Importance of the Coach, The Parents, Coaches View of Parents, What Parents Don't Know or Understand, Key Questions to Ask Parents, Forming the Team, Common Challenges.